(What If? I#38 (fb) - BTS) - When Tony Stark's heart finally gave out, Jim Rhodes took over as Iron Man, apparently serving in the Avengers. (What If? I#38 (fb) - BTS) - After Jim Rhodes had a stroke, his son Michael took over as Iron Man and joined the Avengers. (What If? I#38 (fb) - BTS) - Graviton tried to steal Staten Island, only to have mayor Bellamy levy a property tax on him. (What If? I#38 (fb) - BTS) - During the year when the Vision and Scarlet Witch were separated, the Beast briefly lost all of his fur under unspecified circumstances. (What If? I#38 (fb) - BTS) - Quicksilver died in the final conflict with Magneto. (What If? I#38 (fb) - BTS) - Approximately 19 years after the modern era, during the "Great Purge," Arthur Dearborn (Sunturion) left Roxxon, eventually joining the Avengers. (What If? I#38 (fb) - BTS) - Edwin Jarvis died at some point and was replaced by his nephew Albert. (What If? I#38 (fb) - BTS) - <Approximately fifty years after the modern era> - The Scarlet Witch had become quite infirm, and was cared for by her nurse, Cassandra Lang. Realizing his wife's death was near, the Vision went on inactive status so he could maximize his time with Wanda. (What If? I#38) - The Vision assisted the Avengers in shutting down a clone-snatching ring, after which he returned to Wanda, spending her last few hours by her side. He told her of his intention to terminate his own life functions when she died, but Wanda forced him to promise that he would not due that. After Wanda had had another heart attack, Jocasta suddenly appeared and told the Vision that Dr. Blake needed him as he had discovered a means to save Wanda. Though reluctant to leave Wanda, he accepted Jocasta's offer to watch Wanda for him. He found that Jocasta had tricked him, and when he returned, he found Wanda missing. 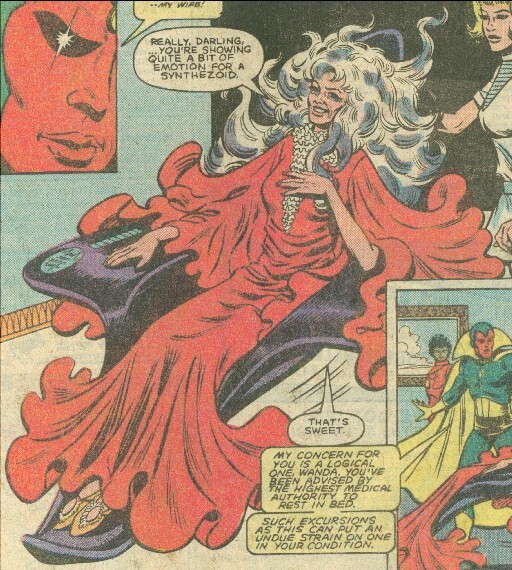 He finally found that Jocasta had taken Wanda to an experimental chamber, and had used Ultron's technology to transfer Wanda's mind into her robot body, and her computer mind into Wanda's frail form. The dying Jocasta just asked that the Vision think of her now and then and that he love Wanda, and then she passed. 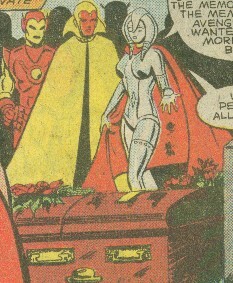 A few days later, the Avengers attended Jocasta's funeral, and Wanda put her scarlet cloak around her new robot body. Comments: Created by David Micheline, Paty, and Andy Mushynsky. The exact point of divergence for this reality is unknown, but characters were based on the characters from the comics in the 1980s. Any dates given should merely refer to the amount of time after the modern era those events occurred. For instance, when they mention 2002, it would mean approximately 19 years after the modern era. The nephew of Edwin Jarvis, he succeeded him as butler of the Avengers. Michael Rhodes. Son of James/"Rhodey", he took on the role after his father had a stroke. The daughter of Scott Lang (Ant-Man), she served as the nurse to Wanda. Long retired from her role as the Scarlet Witch, she still retained some degree of power, though its use placed a heavy strain on her frail form. As she was on the deathbed, Jocasta swapped minds with her, dying in her place so that Wanda and the Vision's love could endure forever.